It’s Valentine’s Day, so naturally what’s the first thing we do? We check Michelle and Barack Obama‘s respective Twitter accounts to find out how they declared their love to each other. Because as we all know, their relationship trumps all relationships, and to be frank, they’re so freaking cute. Are you crying? We’re crying. Here, take this virtual tissue. Plus, it’s the most romantic playlist ever — 44 tracks of pure perfection. It includes the classics like Etta James’ “At Last” and Barry White’s “Can’t Get Enough of Your Love, Babe” and some newer slow jams like Adele’s “Make You Feel My Love” and John Legend’s “All of Me.” It even has some Calvin Harris and Florence and The Machine! Ugh, Michelle has amazing taste in music. Barack responded to Michelle’s tweet a few minutes later, posting an adorable photo of the two of them. 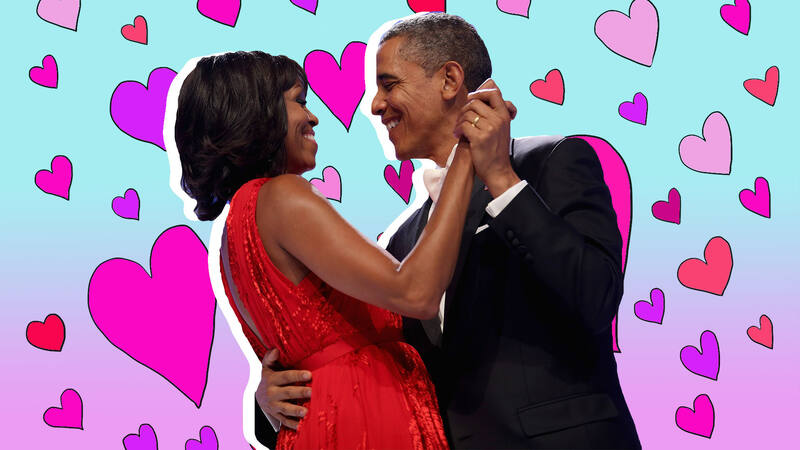 He captioned the tweet, “Happy Valentine’s Day, @MichelleObama. You make every day and every place better.” At the time this article was posted, his tweet had over 590,000 likes and 110 retweets. Impressive. As for Michelle’s playlist? Well, that has nearly 30,000 followers. So, we know what nearly 30,000 people are listening to tonight. Happy Valentine’s Day, you two!